Because Shanna Said So...: Lots and Lots of News!! Lots and Lots of News!! I have lots to share with everyone today. Let's start with the outfit first. So, I have been searching high and low for a pair of lace shorts that were a moderate length. I just can't wear super short shorts anymore. I am getting too damn old for that. Well, as you can see, I found some. Not only is the length perfect, but the high waist hides the muffin tops! Total score! The price gets a big, golden trophy too. They were only $14.99 at TJ Maxx. I grabbed three different sizes to try on because I didn't want to take any chances of someone else snagging them. Call me greedy. I am in love with the color and went with a monochromatic look today. Sometimes, there isn't any need for bold and brights. Next on the agenda is the winner of the Glamour Me Jewels Giveaway. The lucky lady who will be receiving the black and gold chain link bracelet is....Andrea from The Blonde Ambitions. Thanks to all who entered. Don't fret if you didn't win. Go enter the giveaway going on right now! It's a doozie! Onto more news, I have taken over Laura's blog, Beauty & the Beard, today. I adore this girl and am a faithful reader of her blog. She is the sweetest and cutest. She just finished gallivanting on a huge road trip and now she off camping in the woods somewhere. Laura, come back soon, okay!? Now for the MOST important news. I have decided to start accepting sponsors on the blog. There are four different sizes to choose from and each one will run for 30 days. As soon as you submit an ad and it's approved, it will start showing up immediately. Click on the sponsor tab above if you have the slightest interest. I am super excited about this, but FREAKING OUT at the same time. We will see what happens. I would love to have you and grow our blogs together! 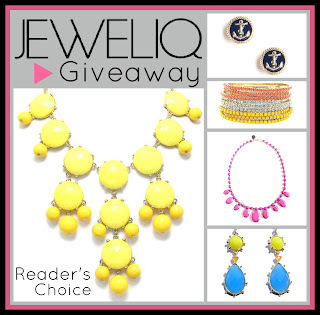 One last thing, don't forget to enter the JEWELIQ Reader's Choice Giveaway. Ladies, if you haven't entered yet, go do it now! I promise, it's worth a few clicks! I hope everyone has a fabulous weekend. Be safe. Be happy. Be back Monday! AV with Long Distance Loving. Go check them out and other fab bloggers! do you belong in vogue? I think so! you are gorg! & yes i agree with stesh, um VOGUE, hellooo! & can i have those shorts :] PLEASE & THANK YOU! Love this look. The headband is a great touch. Thanks for posting affordable pieces! YAY Andrea! If I can't win she's a great alternate ;) Good for her! Safe to say I'm obsessed with your shorts! I've been looking everywhere for the perfect pair of lace shorts too, can't believe you scored these at TJ Maxx -- and at such an amazing price! I love lace shorts and I totally get why you stashed them in the dressing room with you. :) Cute simple outfit! Congrats on doing sponsorship. I started doing this in July and it's fun to meet new people. Have a great weekend! Ok totally in love with those shorts! They are a perfect length! EEEEEKKKK! Sponsors!?!?! This is exciting!!!!! You're such a doll! One of my fav things this summer is the lace shorts - Love them! Such a cute outfit! I totally agree about short length...such a new challenge! And that price makes it unbeatable! this outfit is perfect! perfect perfect perfect! beautiful!!! love those shorts! I am currently attempting to add lace to a pair of shorts I thrifted and I believe I will be spending more than $15. bummer! and yours are WAY cuter! I'm excited that you started accepting sponsors - I've been thinking about the same thing - but am a little nervous about it! I love how you styled the lace shorts! I just got myself a pair yesterday and now I'm trying to figure out what to wear them with. So exciting that you're accepting sponsors! I recently started taking them as well. Have a great weekend, Shanna! Yay for sponsors and congrats for you on finding lace shorts! That is no small feat! The only ones I've seen have been hoochie mama length. Yours are perfection though, love that color! Super pretty look! Love the shorts and blouse :) Lot's of great news, so happy to see your blog growing! Your a good person and have a great attitude and it shows through your words, posts and photos. God bless and have an awesome weekend Shanna! Love the outfit Shanna! Still die over that shirt....went on the hunt at Kohls and no such luck! Have a fabulous weekend and congrats on the sponsor decision. Okay... love this outfit! The top is adorable and those shorts along with your accessories are perfect! Secondly, loved all your choices of bags over at Laura's... Third, way jealous of Andrea winning the giveaway but very happy for her :) and last but not least... I'm going to check out your sponsor page right now :) Happy weekend, Shanna! Wow! Love those shorts. So amazing! I am a MAJOR fan of those shorts, I wonder if my TJ Maxx would have them? I'll hafta check it out! Love the shorts..LCX has great stuff at Kohl's! 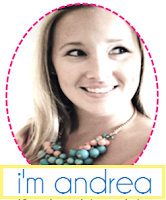 Congrats to Andrea, and I am hoping to be the winner of your next giveaway! Come on Rafflecoter!! :) Hope you are having a wonderful day! Yay for finding the perfect lace shorts! I just found my perfect pair yesterday! I love this outfit! Might be one of my favorites of yours! Yay!!! So excited to win :) Thanks friend!! You look absolutely fabulous as always! I am completely smitten with those shorts! love the whole outfit especially the shorts. yay! for finding one finally. I want your outfit sooo bad!!! it is absolutely gorgeous!! you definitely found the perfect pair of lace shorts - they look awesome on you! You look adorable! Love those shorts...I've been looking for a lace pair too. What an exciting time for you!! Congrats on everything you have going on! BTW loooove that top! Would be so perfect for work! You look amazing and I am loving those shorts. I've been very happy with Invisalign so far. I have to wear them for 8 months. They come in trays, like teeth whitening trays, and you swap out the trays every two weeks. I like that the trays are light and comfortable (compared to traditional braces). You have to take them out to eat. I tried to eat with the trays on and it felt really weird. My dentist advised that I eat without them on and then brush and floss immediately after. It's become routine for me to have a toothbrush and toothpaste everywhere, so it's no big deal. You also can't drink anything with the trays on except water. That's kind of annoying, because I have to take them out to drink coffee, but I think the minor annoyances are worth it for straight teeth. You look suppper adorable!!!! I adore those shorts you found! They are super cute! I would love a pair of those for myself! That shirt you put with it is cute too!!! This is one of my favorite outfit posts by you! So pretty and the scenery/photography is gorgeous! You look beautiful in your outfit, I love those shorts!! It sounds like you have had a wonderful week :) I hope you have a wonderful weekend!! I always think you're the cutest! LOVING those shorts...I haven't found some in a moderate length yet. To TJMaxx, I go :) Have a great weekend, lovely! I am going to TJ Maxx to find these shorts !!!! You look soo cute as always Shanna! I'm in love with your lace shorts--seriously so cute and now I feel like I have to go to TJMaxx, except I know I'm way too old for them! I'm fine with not winning the giveaway since Andrea is pretty sweet. If you could kindly make sure I win the next one, I'd greatly appreciate it! p.s. we need to plan a shopping trip. It would be loads of fun but I fear will shop ourselves out of house and home. Have a lovely weekend lovely lady! Those shorts are seriously perfect!!! You are way too cute, girl. Love the outfit! Adorable look hon..love the neutral vibe... going over to see your guest post now! Love this outfit! You look gorgeous! those lace shorts look perfect on you! I like the length on you, and the high waist fits your body! Love those lace shorts, you look fabulous! Thanks for your lovely comment on my blog, I'm now following you! love the monochromatic outfit. so perfect and summery!! Love those lace shorts! Someone told me they had some at TJ Maxx and when I went to look they were all gone! I just bought a pair of longer shorts too! My short shorts need to go to Goodwill, I'm DEF too old for them! Rock those lace shorts, girl! They look amazing on you. I love the entire outfit! We love Laura!! We got to meet her at our Sephora event just before she left Richmond. She's such a doll! We only wish that we'd gotten to meet her sooner!! Hope you've had a fab weekend! I'm obsessed with the the champagne droplets necklace! After all I'll be subscribing in your feed and I am hoping you write once more very soon!